Welcome to the July 2010 issue of Snapshots. We’ve come halfway through the year and the Pacific continues to be a hive of activity in DRM capacity building. In this edition of Snapshots we provide you with an account of the work being done in the Cook Islands, Solomon Islands and Tonga. In addition, we highlight the first dedicated country-level user training for the Pacific Disaster Net which has just been concluded for Fiji. August will also reveal a lot of interesting initiatives which the CRP is collaborating on with its many partners and of course with Pacific island countries. The major upcoming event on our calendar is the 2010 Pacific Platform for Disaster Risk Management which will be held from 9th – 13th August. In this year’s meeting we hope to broaden the membership of the Pacific DRM Partnership Network and also welcome back colleagues from the Caribbean that also attended the 2009 meetings. We’re certainly making good progress with South-South cooperation. Later on in the year we plan to reveal more about the CRP as it transits with the rest of SOPAC into SPC. So, watch this space... . The Hon. Robert Wigmore, Deputy Prime Minister and Minister responsible for seabed mining activities has today announced concrete steps aimed at progressing seabed mining in the Cook Islands. I would like to begin by acknowledging the Government of Germany for providing the resources for this Pacific regional training course co-hosted by the Government of Fiji and GFZ1 Potsdam1. SOPAC is happy to have been invited to assist with the logistical arrangements including the travel for the regional participants. I would also like to acknowledge other partners including Geoscience Australia, the Institute of Geological and Nuclear Sciences of New Zealand, and the Institut de Recherche pour le Développement, in Noumea. SOPAC’s work in the region in cooperation with Germany goes back many years indeed almost to the origin of CCOP/SOPAC in 1972. Marine geophysical cruise surveys utilizing the RV Sonne are well documented throughout SOPAC history. Regrettably, this direct assistance from Germany has waned. I am hopeful that this training course will re-invigorate those historic ties. The Pacific Islands Applied Geoscience Commission (SOPAC) attended the Pacific Water and Wastes Association (PWWA) workshop on benchmarking and matchmaking on the 6th and 7th of July 2010. The workshop was co-facilitated and co-funded by PWWA and UN-HABITAT. As part of the Global Water Partnerships Alliance, UN-HABITAT are proposing to establish a Water Operators Partnership (WOP) in the Pacific, with PWWA as the facilitators. 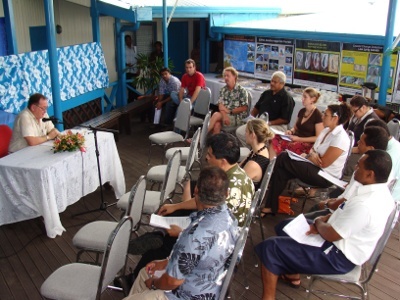 SOPAC undertook a scoping mission to Pitcairn Island from the 30 May to 10 June 2010. The main purpose of this mission was to undertake assessments of water in order to address water security on the island as long term droughts are known to affect the 48-person strong population. In the past, droughts have restricted domestic water supply which is mainly supplied by water tanks (water harvesting) and water available for irrigating crops (mostly from springs). Recently the only borehole and water springs on the island had dried up. This led to the request for solutions to improve their water supply and sanitation on the island. 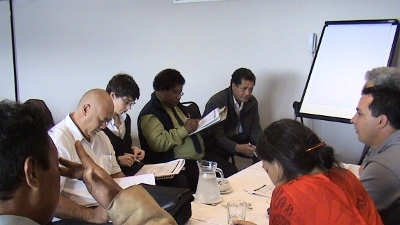 The Water Authority of Fiji (WAF) received training on the use of the Water Quality Monitoring (WQM) database on the 15th July 2010. The training was facilitated by the Pacific Islands Applied Geoscience Commission (SOPAC) and the World Health Organization (WHO) at the WAF national conference room. 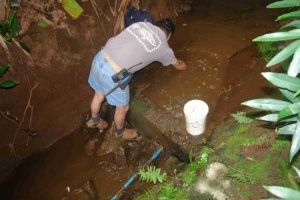 The electronic Access-based WQM database has been developed as part of the regional water quality monitoring and drinking water safety planning programmes of SOPAC and WHO. The database was developed for regional use in partnership with the Institute of Environmental Science and Research (ESR) and the New Zealand Ministry of Health and trialled and tested in the selected Pacific island countries of Niue, Cook Islands, Samoa and Marshall Islands. 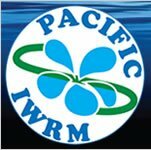 The Pacific Islands Applied Geoscience Commission (SOPAC) wishes to announce the Pacific Platform for DRM from 9th – 13th August, 2010. This years Pacific Platform for DRM is jointly organised by the Pacific Islands Applied Geoscience Commission (SOPAC), the Pacific Sub Regional Office of the Secretariat for the United Nations International Strategy for Disaster Reduction (UNISDR), the United Nation Development Programme Pacific Centre (UNDP PC), the United Nations Office for the Coordination of Humanitarian Affairs (UNOCHA), The Asia Foundation/USAID/Office of US Foreign Disaster Assistance (TAF/OFDA), the International Federation for Red Cross and Red Crescent Societies (IFRC) as well as the European Union (EU) and the Australian Agency for International Development (AusAID) as members of the Pacific Disaster Risk Management Partnership Network. 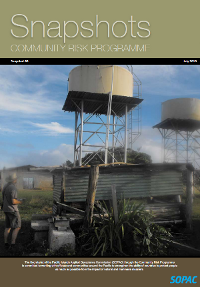 The International Disaster Risk Reduction Day in Papua New Guinea was marked at a special event organised by the National Disaster Centre of Papua New Guinea and supported by United Nations Development Programme (UNDP) and Secretariat of the Pacific Community (SPC). Representatives from key National Government Departments, I/NGOs and Donor partners, UN agencies attended the commemoration ceremony. School children from four schools in Port Moresby also attended the commemoration ceremony.